A handy guide that you can print or store on your smartphone. The June 2, 2013 arrest of Toronto Star photographer Alex Consiglio for trespassing in a Toronto railway station is the latest in a series of events that has PEN Canada’s National Affairs Committee concerned about the interpretation of certain Charter rights pertaining to public photography and filming. 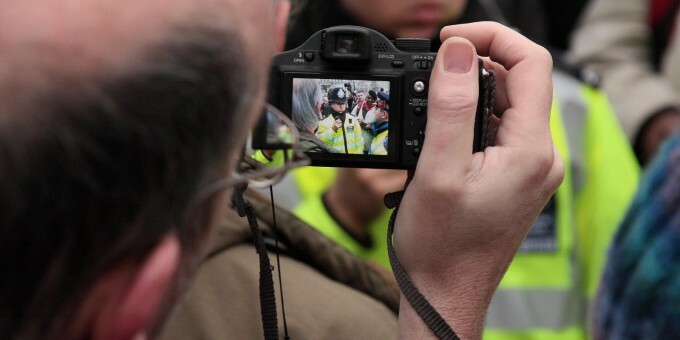 In particular, we wish to state that it is not a criminal offence for individuals to photograph or film police officers as they go about their duties, and that police officers are not allowed to confiscate a person’s camera or recording equipment (including phones), force them to delete images, or otherwise prevent them from taking photographs or filming in public places. We also wish to clarify the law when it comes to taking pictures or filming on private property that is open to the public. People are welcome to take pictures or film in malls, transportation centres, and the like, unless posted signs specifically prohibit it, or until they are requested to desist by a representative of the owners of the property. In such an instance, though the owners or their representatives (such as a security guard) are within their right to request a halt to any further photographic activities, they have no legal right to force the deletion or destruction of photos that have already been taken. The publication of these photos is a separate issue and may be affected by other applicable laws. photographing or filming police officers in public, as long as the photographer/filmmaker does not obstruct or interfere with the execution of police duties. While everyone has a reasonable expectation of privacy in certain circumstances, police officers have no reasonable expectation of privacy as they go about their duties. Other laws and legislation, including the Criminal Code, the Copyright Act, the Security of Information Act, the Youth Criminal Justice Act, and the Personal Information Protection and Electronic Documents Act, the Personal Information Protection and Electronic Documents Act (PIPEDA), must be obeyed while taking or publishing pictures. PEN Canada affirms that the rights of people to make photographs and films in public places and in private places open to the public, and publish them, are hallmarks of a transparent democracy, and that arbitrary restrictions upon photography and filming or on the publication of photographs and films is a characteristic common to repressive governments. Not only do all people in Canada have the right to make images and publish them, but in the age of ubiquitous photography, amateur photographs and films are proving to be an important tool in fighting crime–including crime committed under colour of authority. We also affirm the value of photography and film in securing law enforcement officers from false accusations. This application has already been widely recognized by law enforcement departments across the country, and it’s partly for this reason that video dashcams are now standard issue in law enforcement vehicles. In the past several years, many cases have come to light in which police officers sought to confiscate cameras and delete images, even though (a) they have no legal authority to do so and (b) this may actually constitute a crime in itself. 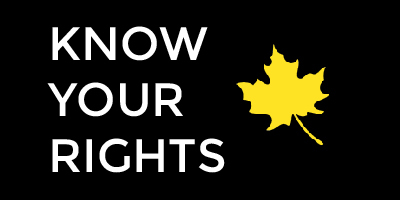 The following incidents point out the need for all citizens to be informed of their rights, and for all law enforcement officers to be aware of those rights. The most glaring example is the case of Robert Dziekanski, a Polish man who died after being tasered by RCMP officers at the Vancouver airport in 2007. Dziekanski’s tasering and subsequent collapse was filmed by Paul Pritchard, who surrendered the video to police with the understanding that they would return it to him in 48 hours. When they did not do so, Pritchard initiated a lawsuit against them. The video was ultimately returned. Partly as a result of its existence, the RCMP eventually admitted that they had misled the public in several statements about the Dziekanski incident. They issued an official apology for their actions and agreed to a financial settlement with Dziekanski’s mother. All four officers involved were formally accused of having lied in notes and statements about what happened that day. Without the existence of the Pritchard video, it is certain that the outcome of the investigation would have been different. Last year, lawyer Karen Selick published an opinion piece in the National Post concerning an incident at the home of one of her clients. During the incident, police confiscated numerous cell phones, deleted images, and made threats of arrest to various people for photographing police activity. Selick contends that the behavior of the police was not only out of bounds but was also criminal. Most recently, on June 2, 2013, Alex Consiglio, a Toronto Star photographer, was arrested at Toronto’s Union Station, put into a headlock by a police officer, and ticketed for trespassing. This came after Consiglio had been asked at least twice to stop taking pictures, including pictures of police officers, and to leave the premises. Consiglio’s case is significant because photography on private property that is open to the public is not an offence and is not civilly actionable unless posted signs specifically prohibit it, or photographers are informed by security guards, owners, or other personnel that they may not take photographs. The owner of Union Station, the City of Toronto, apparently stipulates that members of the public are free to take photographs at any time, but members of the press must first sign a liability waiver. In the opinion of PEN Canada, this requirement for a waiver creates a stifling effect upon the ability of members of the press to do their work effectively, and the requirement should be rescinded by the owner of Union Station. National Post photographers Brett Gundlock and Colin O’Connor were arrested during the G20 protests that took place in Toronto in 2010. These protests were notable for the police tactics used in crowd control and dispersal, including mass arrests, the apparently random arrests of innocent onlookers and passers-by, and the controversial and now-discontinued practice of kettling. Gundlock and O’Connor were attacked by police while attempting to photograph aggressive crowd dispersal tactics. They were arrested and held in a temporary detention center for 24 hours, where they were strip-searched, denied water for 12 hours, fed almost nothing, and experienced the loss of some of their camera equipment. They were never accused of any crime. Instead, they were simply accused of being “amongst violent people”. Their camera equipment and press ID should have exempted them from any police attention whatsoever, and as soon as it became clear that they were members of the press, they should have been free to go about their business. On March 26, 2013, a Montreal student named Jennifer Pawluck, 20, an active protester with no criminal record, discovered some graffiti depicting police spokesman Ian Lafrenière with a bullet hole in his head. She took a picture of the image and posted it on Instagram. On April 3, Pawluck was visited at her home by police officers and arrested without incident. She was charged with uttering threats against Lafrenière. In the warrant, it was stated that she gave Lafrenière cause to fear for his safety, and one of the conditions of Pawluck’s release was that she must not come within one kilometre of police headquarters or Lafrenière’s home. It is notable that Pawluck was never accused of having created the original image, only of taking a picture and distributing it. PEN Canada considers this to be a particularly egregious violation of the Charter right to self-expression. In September of 2012, 16-year-old Jakub Markiewicz was detained by security guards and arrested by police after filming the violent takedown of a man by security guards at Metrotown shopping mall in Burnaby, B.C. Markiewicz was ordered by the guards to delete his footage, but since he was using a film camera, he could not comply. Although the guards were in their right to order Markiewicz to stop filming, they were not legally authorized to order him to delete the image or to destroy the film. After Markiewicz took a second picture of arriving RCMP officers, he was physically attacked and restrained by security guards. At their request he was then handcuffed by police and taken to an RCMP cruiser, where security guards again demanded he delete the photos. RCMP officers cut Markiewicz’s backpack off with a utility knife in order to search it, and Markiewicz was ultimately arrested for causing a disturbance. He was never officially charged. A Niagara police officer is facing criminal charges of assaulting a photographer outside a bar in May of 2012. Constable Paul Zarafonitis allegedly assaulted Michael Farkas after Farkas refused to stop photographing police during an incident at the Kool Kats Caribbean Restaurant in Niagara Falls. Farkas suffered a broken nose, a fractured orbital socket, and a fractured cheekbone. While American federal and state law differ from Canadian law in many important respects, two incidents have taken place there that we believe are worth mentioning in this context. On May 14, 2012, the United States Department of Justice wrote a letter to the Baltimore Police Department asserting that the right of people to photograph and film police officers is protected by the First, Fourth, and Fifteenth Amendments to the Constitution. The DOJ also stated that the ability to photograph and film police officers does much to enhance the appearance of transparency of law enforcement organizations and is therefore a way of building public trust and goodwill. PEN Canada believes that the DOJ is entirely right in this assertion, and we wish to uphold and adopt it as our own. After the terrorist bombings in Boston last April, as noted in this Washington Post article, citizen photography played a hugely important role in establishing the identity of the bombers. Investigators received hundreds of still and moving images from cell phones and handheld cameras that allowed them to piece together a timeline and ultimately to find images of the suspects, resulting in the death of one and the capture of another. Often police officers seem willing to use violence to stop photographers, as if photography itself were a form of assault instead of a right. We believe these instances offer additional evidence that public photography should ultimately make for a more transparent, open, and free society, provided standards of privacy and decency are adhered to. It also fosters a more law-abiding culture. The incidents mentioned above show that police officers are sometimes prepared to deprive people of the rights set out above in this memo. Neither photography nor filming in and of itself constitutes obstruction. Often police officers seem willing to use violence to stop photographers, as if photography itself were a form of assault instead of a right. This state of affairs must not be allowed to continue in Canada. PEN Canada calls upon law enforcement officials to recognize that photographing and filming in public places is in the public interest, and to ensure that their personnel are familiar with the laws concerning public photography/filming and photography/filming of police officers. We encourage people to continue to exercise their right to take photographs and make films in public, to photograph or film actions committed by law enforcement that may be worthy of concern, and to publish these images public, secure in the knowledge that they are within their rights to do so. * Examples as currently defined by the government of Canada include Operations Zones – areas where access is limited to personnel who work there and to properly-escorted visitors, which must be indicated by a recognizable perimeter and monitored periodically; Security Zones – areas to which access is limited to authorized personnel and to authorized and properly-escorted visitors, which must be indicated by a recognizable perimeter and monitored continuously; and High Security Zones – areas to access is limited to authorized, appropriately-screened personnel and authorized and properly-escorted visitors, which must be indicated by a perimeter, monitored continuously, and to which details of access are recorded and audited. 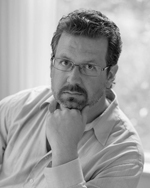 William Kowalski is a member of PEN Canada’s National Affairs Committee and the author of The Hundred Hearts, published by Thomas Allen, and seven other books. He lives with his family in Nova Scotia. Featured photo by Russell Trow via Flickr.